1. Ground yourself. Touch the metal surface (as shown below) on the inside of the computer to discharge any static electricity. Warning: Always discharge static electricity before you touch any parts or install any components inside the computer. To avoid generating static electricity, do not walk around the room until you have finished installing the part and closed the computer. 2. 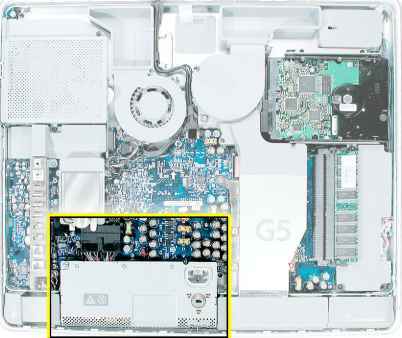 Locate the power supply shown in the picture below. 3. Remove the screw on the far right and loosen the other two screws by turning them completely counterclockwise. 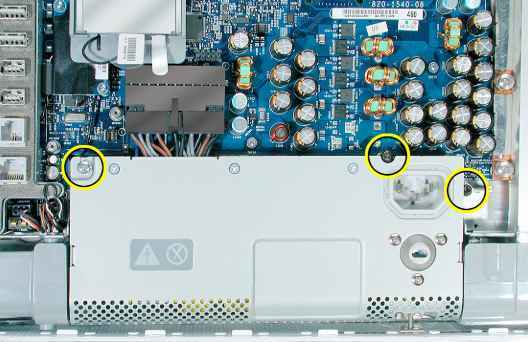 Note: The middle screw and the screw on the left are captive; they will not come out of the power supply. 4. 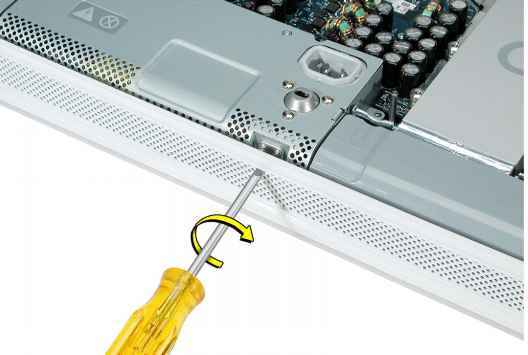 Disconnect the power supply cable by pressing the connector release tab and using a wide, flat blade screwdriver to pry apart the connector. 6. 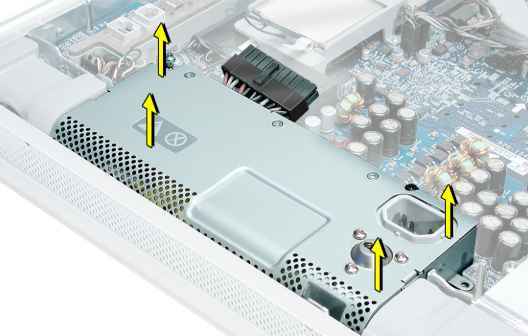 To unlatch the power supply, tighten the middle case screw by turning it clockwise five to eight revolutions. 7. 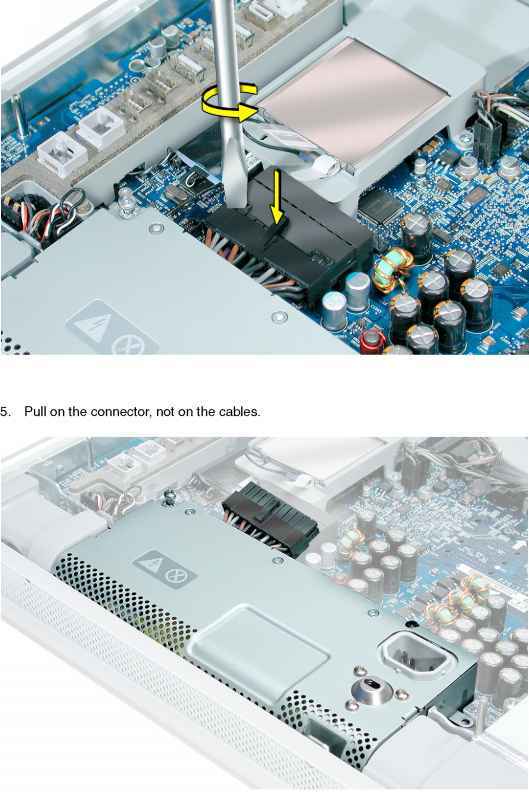 Lift up the power supply at the sides approximately five mm or until it touches the middle case screw. 8. 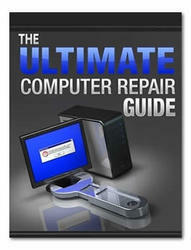 Tilt up the power supply until it clears the edge of the main circuit board. Lift it out of the computer and set it aside. How to remove case for i mac g5 20 inch? How to remove static discharge? 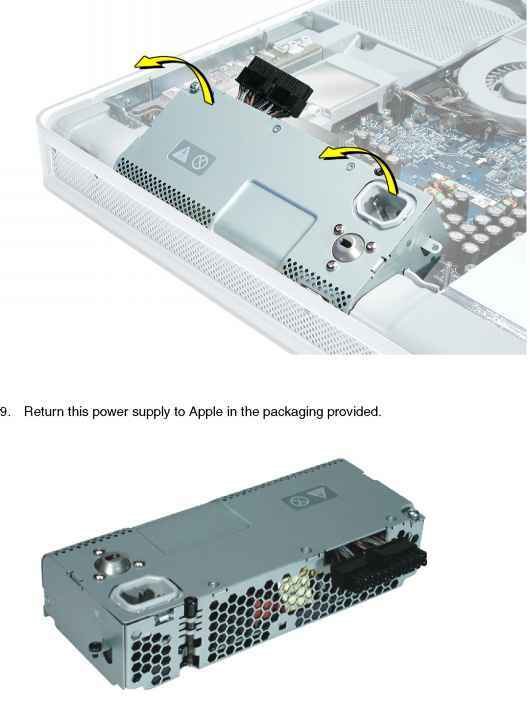 How to remove power supply imac g5 20? How to avoid Electro static Discharge?